Christmas morning! The kids were so excited! Clayten told us he was going to jump on us in the morning and yell wake up it is Christmas. So Jeff and I woke up before them and we were waiting for Clayten to come and jump on us. So when we heard they were coming into our room we pretended we were sleeping and the kids just stared at us for a minute and finally I opened my eyes and they were just standing there. I said how come you didn't jump on us and he said because Becca was in the bed next to me. Ha Ha! The kids sure had fun opening their presents and it was fun watching them open them too. Rebecca was happy and just sat there and watch the kids and would go over to their stuff and play with it and push boxes around the front room and occasionally try to open a present of hers. Good times! Later that day we had a yummy turkey dinner with Jeff's parents. We Hope you all had a Merry Christmas and a Happy New Year! Here is Rebecca playing with Madison's candy. Madison got a keyboard and I am going to teach her the basics of piano. Clayten got a nerf gun that shoots over 25 bullets in a minute. He had fun shooting everyone. Madison gave Clayten a nerf gun. So here is dad shooting at clayten. Our family Christmas present was a WII. We have wanted one for awhile now. They are so dang expensive but fun to play together as a family. I rule at bowling! Our friends from Arizona came into town for the weekend. We hadn't seen them for awhile so we enjoyed having them at our house. It made me miss Arizona especially during this cold winter. 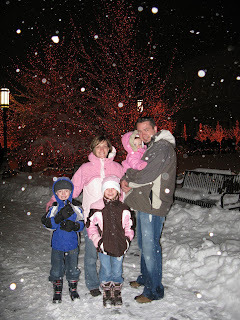 They were able to go skiing, we saw the lights at temple square and took a stroll down main street in park city. We had a fun time! The lights were spectacular as usual. It was snowing and so cold but that didn't matter. 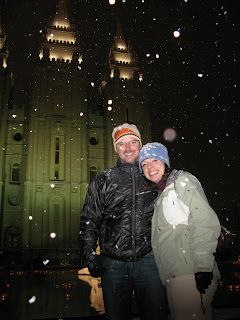 The temple is so beautiful! We had fun as a family putting the gingerbread houses together!